The Secret Destiny of America - Bill Schnoebelen is one of the main experts in this video, which unfolds the fascinating history behind the founding of America, and exposes the esoteric underbelly of its design. Nearly 3 hours of intensity! This DVD was an official selection of the New York Film Festival for quality and historic content! If America was founded as a Christian nation, why are many of its symbols, buildings, and monuments based on Pagan traditions? There is no doubt that much of America’s national heritage was Christian, but just as a coin has two sides, our national heritage has a second side – one based squarely on occult secret societies and their values. To find the answer to these questions, we follow the journey of secret societies from England to the New World and learn of their ancient hope: to rebuild the lost empire of Atlantis. In the 16th century, Sir Francis Bacon was at the helm of the secret societies in England. 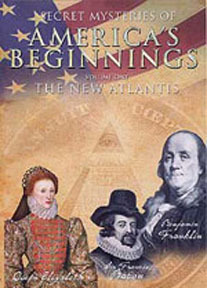 When Bacon penned his classic work, ‘The New Atlantis’ he believed that America and Atlantis were one and the same. He outlined his vision for the perfect society, and some suggest the program he set forth has been the driving force behind the course of modern history. While he did not originate the concept, it was Bacon who articulated an ancient plan to be carried out by all the secret orders. As Chief of the Rosicrucians and the first Grand Master of modern Freemasonry, Bacon sent his followers to the new world. A 1910 Newfoundland stamp with his image upon it reads, ‘Lord Bacon: the Guiding Spirit in [the] Colonization Scheme.’ Because of his influence, Francis Bacon is considered by some to be ‘the real and true founder of America.’ For centuries, controversy has surrounded this figure who is said to be the illegitimate son of Queen Elizabeth I, and secret author of the Shakespeare plays; the man whom Thomas Jefferson considered one of the three most influential men in history. Is it possible that Bacon’s vision guides America today? President Bush reiterates the Bacon ideal: "When our Founding Fathers declared a 'New Order of the Ages', they were acting on an 'Ancient Hope' which is meant to be fulfilled." (President Bush, January 20, 2005, Second Inauguration Address) Where The DaVinci Code meets National Treasure: Learn the incredible secrets of the esoteric traditions, hidden within the manifold layers of signs and symbols in our nation’s infrastructure. Find out why some believe that from ancient times America has been chosen to fulfill a secret destiny.